Strange, A.M., Dreher, A., Fuchs, A., Parks, B., and Tierney, M.J. 2017. Tracking Underreported Financial Flows: China’s Development Finance and the Aid–Conflict Nexus Revisited. Journal of Conflict Resolution, 61(5), 935-963. China’s provision of development finance to other countries is sizable but reliable information is scarce. 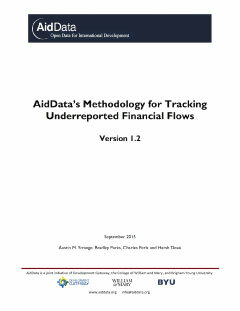 We introduce a new open-source methodology (AidData's TUFF Methodology, Version 1.2) for collecting project-level development finance information and create a database of Chinese official finance (OF) to Africa from 2000 to 2011 (AidData's Chinese Official Finance to Africa Dataset, 2000-2012, Version 1.1). We find that China’s commitments amounted to approximately US$73 billion, of which US$15 billion are comparable to Official Development Assistance following Organization for Economic Cooperation and Development definitions. We provide details on 1,511 projects to fifty African countries. We use this database to extend previous research on aid and conflict, which suffers from omitted-variable bias due to the exclusion of Chinese development finance. Our results show that sudden withdrawals of ‘‘traditional’’ aid no longer induce conflict in the presence of sufficient alternative funding from China. Our findings highlight the importance of gathering more complete data on the development activities of ‘‘nontraditional donors’’ to better understand the link between aid and conflict. We provide our replication package for this article at http://aiddata.org/replication-datasets. 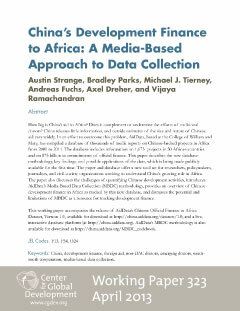 An earlier version of this article, China's Development Finance to Africa: A Media-Based Approach to Data Collection, is available as a working paper from the Center for Global Development.